Charleston SC Brides: All Dressed in What? Well, nearly 30 years ago, most brides wore white and designers provided a tokenized ivory alternative – end of discussion. It didn’t matter that bleach-white isn’t exactly a color that compliments all skin tones, including those with more wan complexions. In 2010, when brides are searching for novelty in their weddings and fashion-driven gowns, many are opting for non-white variations, and designers are only too happy to comply with gowns offered in nuanced colors such as diamond white and candle. The shift in color direction has prompted bridal boutiques to update their inventory mix. With the popularity of softer, ethereal looks in bridal dresses, often accented with floral appliqués and romantic laces, it’s natural that gowns are taking on richer hues. “There’s a very vintage feeling to these slightly darker colors,” says Jessica Wilson, designer for Alvina Valenta, who is offering a strapless sheath in ivory lace for her fall 2010 line. The color differences may be subtle, but their effect as a silhouette can be huge. So, brides should take heed of their skin tones and pick their gowns accordingly. Here’s a rundown of a few 21st century gown colors as interpreted by various bridal designers and suggestions as to what skin tones can pull them off the best. In spite of the tonal challenges of white, most brides still wear the color, and, of course, usually look stunning and rapturous on their special day. But, color experts say, white-white usually looks best on skin tones that are darker, such as olive, brown and ebony. If a bride is adamant about wearing nothing but white and her skin is lighter, she can stick to gowns made with lighter fabrics, such as silks and chiffons, that drape more and soften the silhouette. For a variation, some designers are offering diamond white, which has a richer, snow-white patina that suits porcelain skin. Alvina Valenta is offering a spaghetti strap drop-waist tulle ball gown in diamond white, and Maggie Sottero incorporates diamond white looks in her collection, including Ingrid, a strapless gown with an embellished neckline, and Venecia, a ruched strapless gown with a pleated ruffle skirt. Watters’ eggshell gowns have a beige-y tint that also suits fairer skin tones. Eggshell is among the most popular wedding colors in the line, says Maria Prince, Watters’ vice president. A top-seller is Torreon, which is a re-embroidered lace and duchess silk satin strapless gown detailed with lace floral appliqués. Another look for the season is Kalahari, a silk taffeta strapless gown billowing with pick-ups. At Amy Kuschel Bride, gowns that come in candle are often made in the sheerest of fabrics, says Amy Kuschel, the San Francisco designer behind the self-named collection. Candle is the lightest of ivories, while pearl is a creamy white. The colors suit fair complexions with a hint of pink undertones. A few of the fall 2010 looks include Origami, a strapless trumpet silhouette with fan details, and Beau, a sheath with an empire waist and sheer netting. Heavier fabrics, such as silk satin and charmeuse, lend themselves to the ivory family. Darker than white, with hints of yellow, ivory gowns suit a number of skin tones, including paler complexions. Ivories still differ among designers – not dissimilar to battles that take place in the Home Depot paint aisle. A Vera Wang ivory might be darker than a Cymbeline. So when shopping, brides should put the gown directly to their faces for the best viewing. Champagne is a warmer color with undertones of pink that can enhance pale skin tones with rosier undertones. Jenny Packham’s fall 2010 collection includes a gown similar to the champagne-colored strapless bustier style that Miley Cyrus rocked at the 2010 Oscars. A highlight of the Maggie Sottero line is Emily, a strapless satin gown in Champagne Mist with beaded embellishments. Cymbeline also included a champagne gown in its 2010 line. More adventurous brides may take to gowns with hints of colors, such as apricot, peach and sherbet, which can look warm, pinkish and enhance olive skin tones. Vera Wang’s fall line includes a strapless shirred tulle gown in apricot. Alvina Valenta is offering a sherbet gown in satin organza with a flowing tiered skirt. The key, Wilson says, is to keep the silhouette somewhat slim when embracing color. These colors represent a snapshot of the choices available to brides. To help brides sift through this color rainbow, designers often turn creative in selecting monikers for their non-white shades. One appeal of these alternative colors is that the dresses can even get an encore appearance or two. 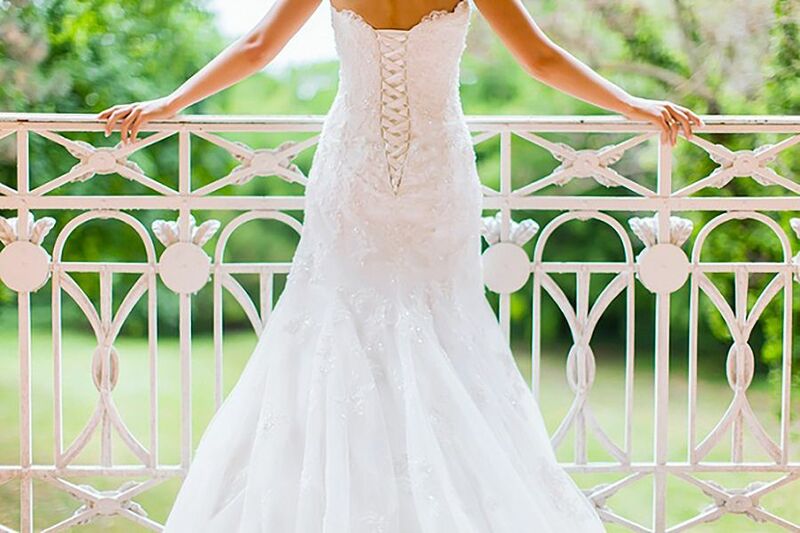 “Some of these colors don’t scream wedding gown, like champagne, so a bride can wear them again,” says Rasha Mikho, manager of Mimi’s Bridal Boutique in Ann Arbor, Mich., which carries gowns by Melissa Sweet, Augusta Jones and Allure. And, hopefully, that’s not to her second wedding.